Two weeks ago Agentinian government decided to expropiate YPF, causing a bitter diplomatic dispute and showing once again the importance of fossil fuel control in current politics. This week another example, smaller but with some common points, was published: Bolivian government expropiated TDE, electrical distribution company owned by spanish REE. REE is the Spanish electrical distribution company, partially public and offers very detailed data about production and consumption of electricity. The difference with Argentinian case is fundamentally the size, Repsol and YPF are the biggest companies in their countries while REE and TDE not; the calculated values of the assets is 100 times smaller for the later. And the attitudes between the governments not very aggressive. 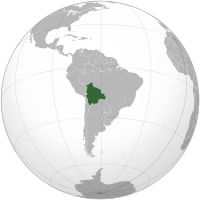 Besides, it is not the first case of expropriation from Evo Morales and at the same time it has assured Repsols position in Bolivia to sell gas to Argentina, closing this funny circle. The common ground is the claim from Bolivian government for more investment in the poor Bolivian electricity distribution. Bolivia is a poor country, but rich in some resources as gas and lithium for batteries. I spent one summer there and remember that electricity was not found in every house. Bolivia was quite active in Durban talks asking for a stronger commitment by rich countries towards CO2 emission reduction, whereas Bolivian electricity production was %48 hydroelectric and the other %52 from fossil fuels in last year. It can be said that half of its electricity is renewable but it is also true that their effort in wind or solar energy has been null. Nevertheless, the important data is the CO2 per capita emissions, and Bolivia has a very low value: 1.4 tons per capita in 2008. It is also a gas seller, getting a very important income for the national economy. Bolivia is poor and has the right to improve its weak energy services. At the same time it is vulnerable to climate change and has the right to ask the main emitters for a strong commitment for CO2 reduction. But at the same time Bolivia also has the great opportunity to built a low Carbon economy from the beginning and get a moral bonus this way. The straightforward use of their great fossil fuel resources is very tempting and will have to be done to some extent but a wise combination with renewables will be more reasonable in the long-term in spite of short-term higher costs, even more remembering the great amount of lithium in the Salar de Uyuni. Electric car industry is waiting for it. I think that all have to make some effort, not the same, I agree. We do not have to remember climate change only in the great meetings; Bolivian new energy strategy may be a good example of that, it is in their hands now.